I've been tweeting for a couple weeks now with all sorts of great information on holiday email marketing. I've also been paying more attention to holiday emails sent to me. 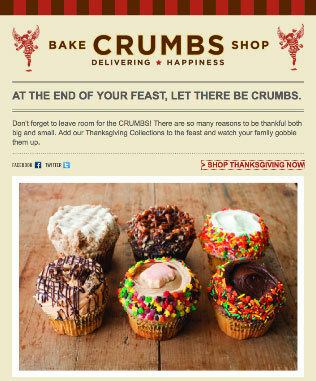 This morning, an email from Crumbs Bake Shop caught my attention. I would be lying if I said this post wasn't motivated by the excuse to stare at these delectable treats for a little while. Can you blame me? At least they're on my computer screen and not on my desk. Otherwise they'd already be in my belly. The email itself is quite simple: a headline, three sentences, a link with a simple call to action and a picture of cupcakes. In fact, the cupcakes in the email looked so good that I clicked on through to the website...which brings me to the point of my post. Crumbs did a great job of making sure that the landing page made sense, coming from the email. The email promotion itself suggests cupcakes for dessert this Thanksgiving. The link directs you to their cupcake page on their website. Not only that, but the holiday-themed cupcakes were all at the top, above the fold. A subscriber coming into the website couldn't possibly miss what you wanted them to see. Granted, I'm not ordering Crumbs for Thanksgiving. I'm going back home to Chicago and their bakery hasn't opened there yet. Thus, I can't say how their check-out process goes. I do know that if I were Crumbs, I would try and get the customer to re-up by offering a discount on Christmas or Hanukkah cupcakes at check-out if the customer were to order right then and there. This would be a mutually beneficial tactic. Crumbs would more than likely boost their holiday cupcake sales. The customer would not only get an additional discount for ordering their cupcakes early but also have dessert crossed off their holiday checklist. There are so many ways that Crumbs could have gone wrong with this campaign. They didn't go overboard with their sales pitch in the Thanksgiving email. It was simple and the copy was playfully tied into the holiday saying, "watch your family gobble them up." Next, the link pushed the recipient to the appropriate landing page. 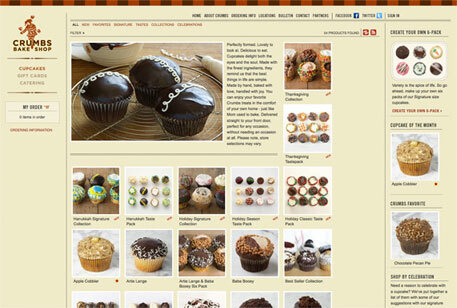 The page's design and layout makes sense in relation to the email and keeps the customer's attention on the holiday-themed cupcakes. I may not be having Crumbs for dessert on Thanksgiving, but I just may tonight!